If you are using sat-nav to find the Memorial Park, and you are coming from the South, the machine may suggest a route via the A145 to Beccles, and then cross country. Please do not use this route, as some of the roads are very narrow. 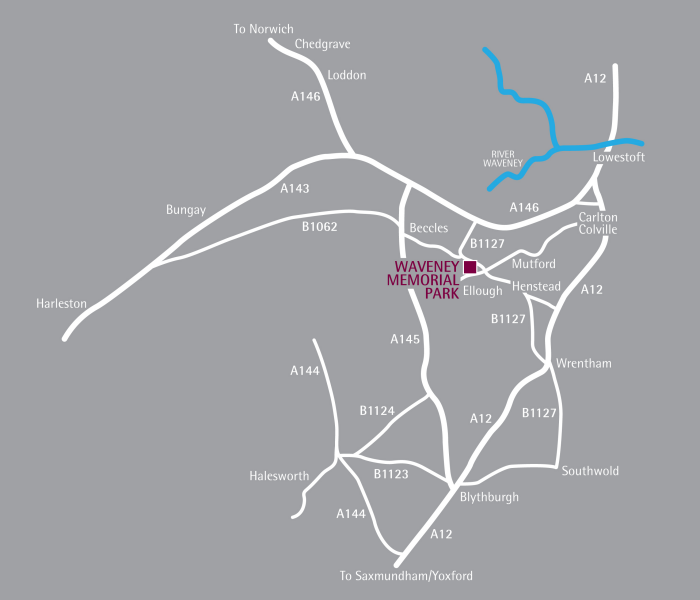 Instead we suggest you take the A12 to Wrentham, then the B1127 through Henstead and Hulver Street, to Ellough Airfield. The facility is then signposted on your left. Either: take the A146 toward Beccles. At North Cove, just after the Three Horseshoes pub turn left on the roundabout on the B1127 Benacre Road towards Wrentham and Hulver Street. On reaching Beccles Airfield, the Memorial Park is on the right, accessed from Warrens Lane. Or: From Carlton Colville, take Mutford Wood Lane towards Mutford, then towards Hulver Street. At the junction with the B1127 Benacre Road turn right. The Memorial Park is at the top of the hill on the left, accessed via Warrens Lane. From Southwold: Take the B1127 to Wrentham, then Henstead, then Hulver Street. After Hulver Street the Memorial Park is at the top of the hill on the left, accessed from Warrens Lane. From Saxmundham, Yoxford and Blythburg: Take the A12 to Yoxford then Blythburg, to Wrentham. At Wrentham, take the B1127 Benacre Road to Henstead, then Hulver Street. After Hulver Street, the Memorial Park is at the top of the hill on the left, accessed from Warrens Lane. From Halesworth, Wisset, Chediston and Wenhaston: Take the Beccles Road B1124 then A145. In Beccles, turn right towards Lowestoft and Worlingham, at the traffic lights at Peddars Lane. Turn right at the next traffic lights following the same sign directions. Continue over the level crossing. Just after the Ingate Hotel, fork right at the traffic lights towards Hulver and Wrentham on the B1127 Ellough Road. After 1.5 miles you will reach Ellough Industrial Estate. Keep straight on at the roundabout, towards Hulver Street. The Memorial Park is on your right after 800 yards, accessed from Warrens Lane. From Harleston and Bungay: Take the A143 then A146 towards Lowestoft. After the Worlingham roundabout, turn right at the next roundabout on the B1127 Benacre Road. Follow this road around towards Beccles Airfield. The Memorial Park is on your right after 1.5 miles, accessed from Warrens Lane. From Beccles: From Ingate on the Lowestoft Road fork right at the traffic lights towards Hulver and Wrentham, on the B1127 Ellough Road. After 1.5 miles you will reach Ellough Industrial Estate. Keep straight on at the roundabout, towards Hulver. The Memorial Park is on your right after 800 yards, accessed from Warrens Lane. From Chedgrave, Loddon and Thurlton: Take the A146 towards Lowestoft. After the the Worlingham roundabout, turn right at the next roundabout on the B1127 Benacre Road. Follow this road around towards Beccles Airfield. The Memorial Park is on your right after 1.5 miles, accessed from Warrens Lane. Buses: Unfortunately the Memorial Park is not on any recognised public bus routes. Train Station: The nearest train station to the Memorial Park is Beccles Train Station which is approximately a 10 minute drive away ( approx. 5 miles distance). Taxis: There are numerous taxi companies located in Beccles who regularly drop off and collect again at the Memorial Park, details of which are available via an internet search.